This is what is known from the publicly accessible court docket in Ohio’s July 8 fraud case against alleged Profitable Sunrise promoter Nancy Jo Frazer (also known as Nanci Jo Frazer), Focus Up Ministries and others: On Sept. 24, the docket of the case noted that the judge had ordered the release of $20,000 to Frazer and her husband (David Frazer) to pay legal bills. Another $8,000 was made accessible to Albert Rosebrock, another defendant, to pay legal bills. Purported Profitable Sunrise operator “Roman Novak” and his brother “Radoslav Novak,” a purported attorney associated with Profitable Sunrise, may be fictitious, according to the SEC, which has described Profitable Sunrise as a murky and massive international pyramid scheme that potentially gathered tens of millions of dollars. “Profitable Sunrise operates for the benefit of unknown individuals and/or organizations doing businesses through companies formed in the Czech Republic and using bank accounts in the Czech Republic, Hungary, Latvia, and China, among other places,” the SEC alleged in April. “There is more than a slight possibility, as with many offering frauds, that the people described in the [Profitable Sunrise] website, including the Novak brothers, do not exist,” the SEC said. On Oct. 5, 11 days after the Sept. 24 Ohio docket entry, someone using the handle “scampoliceinsider” and a photo of a news reporter posted something that resembles a news story on the Topix.com site for Ogdensburg, NY., near the Saint Lawrence Seaway and the border with Canada. Gregg Evans, a poster and occasional guest columnist at the PP Blog and a regular poster at the RealScam.com antiscam forum, posted a link to the Topix story at RealScam.com on Oct. 13. The Fox Toledo outlet now is “in position to be turned in to be put under regulators [sic] scrutiny and to be liable for a full investigation which connects them to another scam,” according to the Topix story. Paris is the editor of ChristianMoney.com and recently published an ebook on what he describes as his pressure-packed, nerve-racking experience writing about Profitable Sunrise and the enmity directed at him from certain members of the Christian community. Paris denies he is a convicted criminal, saying that he once was named in a civil securities action in Maine after his brother embezzled money from a Paris company and hid the act from Paris and accountants. Now, back to the Topix story referenced above . . . The photo of the reporter that appeared alongside the Frazer story on Topix in Ogdensburg, near the Canadian border, appears to be a low-resolution copy of a professional portrait/publicity still of a real reporter, a broadcast journalist who started her career at a California TV station in 2010 and accepted a job in 2012 at a station in Nevada, where she works as a weekend anchor. The photo does not identify the reporter by name and appears to have been taken while the reporter was working for the California TV station prior to moving on to the Nevada station. In the Blog’s view, the Topix story does not read like one prepared by a trained, working journalist. Rather, the story on Topix reads like fractured marketing and PR fluff of the type often seen in the HYIP sphere. At least part of it seeks to demonize both the media and the government. Similar situations occurred after the action by the United States against ASD in 2008. Online scammers have been known to pose as legitimate members of the media to add presumptive authority to a scheme. In 2011, the famous brand of Consumer Reports was appropriated by scammers to drive dollars to an acai-berry scheme, the FTC said. Meanwhile, “fake” news sites in the United States using the image of a real reporter from France were used in the acai scheme. The PP Blog would be very surprised if the Topix story was authored by a real reporter, especially one using the handle “scampoliceinsider” and trying to stick it to a TV station in Toledo, other media outlets and Ohio authorities in this bizarre fashion. Well, if Nanci Jo was dumb enough to have any part of this, she just added to her legal problems not only with Ohio officials but the Feds as well. The sad part is I can see her involved in this. This is nothing more than an attempt at damage control to keep the majority of her followers still believing in her. Well, there is a Blogger blog with a username of “scampoliceinsider.” The avatar is of a man and the image source appears to be slugged working+man.jpg, a clipart file. 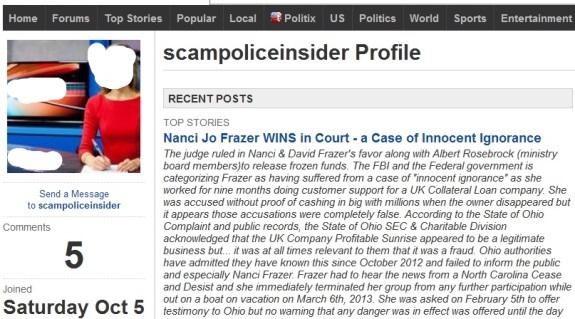 In any event, there is a “scampoliceinsider” on Blogger using male clipart, and there is a “scampoliceinsider” on Topix using the photo of a female reporter. I’ve also seen scammers spam the unvetted content section of CNN and AllVoices to create “legend” for a fake university called “Riverbanks University”. The funniest one I’ve seen have them claim to be an audit authority (clone of TrustGuard). Clearly this someone sympathetic to NJF trying to do some spin control. There’s some of them for every Ponzi scheme. Isn’t Craddock still doing his thing for Zeek? How, exactly, does one return “ASSTES”??? Yes, this claim that I am a convicted felon continues by Nancy Jo Frazer. I have considered suing her. I have been advised that I could easily win a lawsuit at this point, but I have also been advised that she will likely have no assets to go after when this whole episode is over. So, for now she is ‘lawsuit proof’ but I may still considering suing her to get a judgment just as a matter of principle. This is the reason why I don’t feel ‘sorry’ for Nancy Jo Frazer. A truly confused ignorant victim would not be engaging in such tactics as a means of hiding her own guilt. Nancy why don’t you just address the facts of the various cases against you? There you have it, obviously. My father drilled in to me years ago, “Don’t believe everything you read in the newspaper”. With the internet providing instant “poublished author” status to anyone with an ISP and a keyboard, clues like those pointed out above tend to expose the uneducated, eternally hopeful, gleefully mischievous or blatantly criminal. There seem to be trolls out there just to get a rise from us scambusters. I had a guy who kept posting crap on my Hubpages hubs about TVI Express about “you can earn money with Hubpages”, obviously implying I had an ulterior motive. Those who actually used Hubpages would have known that most articles pay pennies, if at all. Seems that fake reporter (or a colleague) just spammed the same narrative over in one of my links to one of your Profitable Sunrise articles. Some garbage about FCC will sanction WTOL for false reporting and used the same “FBI” “innocent ignorance” story. It came in while your website was down last night. K. Chang: It came in while your website was down last night. Do you recall what time you observed the outage and perhaps remember the error message you saw? I did not take the Blog offline last night. The PP Blog had an extended outage yesterday afternoon that required about two hours to fix. It likely was caused by bots. There’s a chance it could have been hit again last night and self-recovered, based on your comment. On Tuesday, the Blog recorded only about one-third of the usual volume of traffic, according to my Google stats. There might have been an extended outage that day that I missed because I mostly was working on research. The Blog might have self-recovered on Tuesday. Yesterday afternoon was an altogether different story — boom! It was out. K. Chang: Seems that fake reporter (or a colleague) just spammed the same narrative over in one of my links to one of your Profitable Sunrise articles. Some garbage about FCC will sanction WTOL for false reporting and used the same “FBI” “innocent ignorance” story. Please post a link to your URL where that narrative appears. Is anyone making an attempt to track down the Novak brothers and hold them accountable for this fraud scheme? There is (in all likelihood) no Novak Brothers. it’s just some synthetic personality some scammer made up as the frontman. admin: Please post a link to your URL where that narrative appears. Thanks for this, K. Chang. As for the third sentence, as you and others pointed out, no evidence has emerged that “Roman Novak” even existed. Beyond that, the stuff about the server migration and the “massive worldwide internet virus” reflects the bizarre narrative that was on the Global Impact Resource Alliance site. Quick note: Have now received UFunClub/UToken spam aimed at this Profitable Sunrise thread. So, while a major UFunClub/UToken probe is under way in Thailand, spammers are targeting stories about Profitable Sunrise, another transnational scheme. IP was from North Las Vegas, Nev.